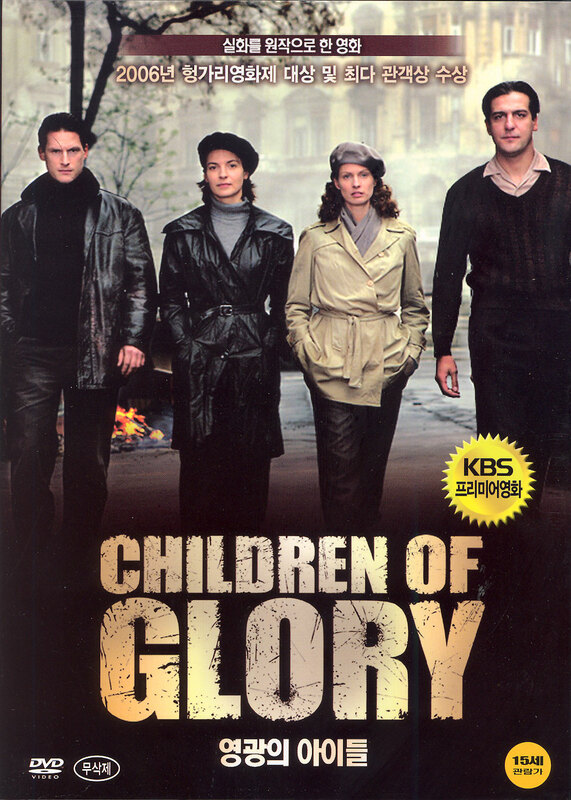 Children of Glory is the English transliteration of the Hungarian movie name Szabadság Szerelem, which actually translates to "Freedom Romance" or "Love of Liberty". 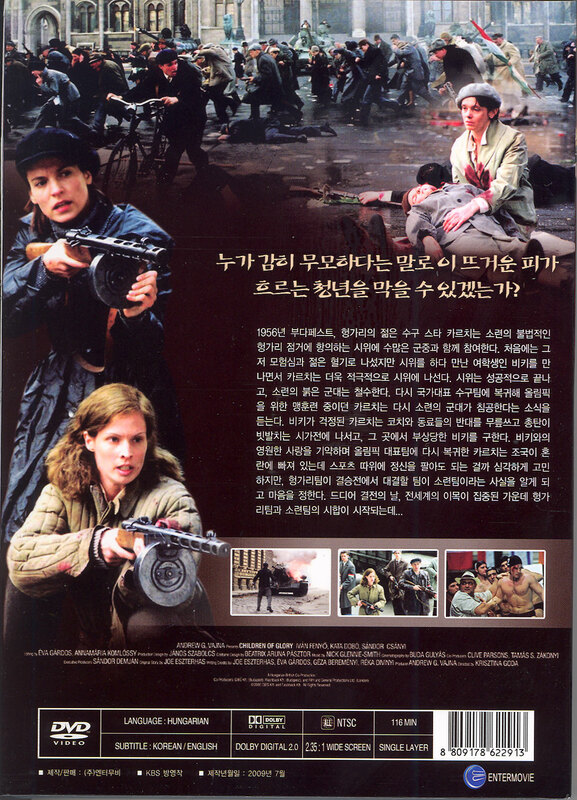 It is an epic movie along the lines of Dr. Zsivago, but about the Hungarian Revolution instead of the Russian one. Children of Glory takes place in Budapest and at the Melbourne Olympic Games in October and November of 1956. This 123-minute Cold War drama is about common people thrust into history and heroism. With stunning realism and adherence to the facts, this epic has citizen soldiers falling in love even as they battle Soviet tanks that were destroying their homeland. The action culminates in the famous Olympic water polo match in Melbourne where the Hungarian team played the Soviet team in what has been described as the bloodiest water polo match in history. If you are a Hungarian, or a descendant of a Hungarian, this is your heritage. It will make you cry and it will make you proud. For more info, check the official movie website and the IMDb record about the movie. Why does the DVD look Korean? Because it is printed in Korea, and here is why. When the Szabadság Szerelem (Children of Glory) debuted in Hungary during the 50-year commemoration of the 1956 Revolution, it was greeted with such acclaim, local and international, that foreign versions were demanded. First came Europe and soon thereafter some of Asia. Then everything stopped. We have heard conflicting stories of what halted distribution. Some say the Producer, Andrew Vajna, lost interest with the tragic death of his son near the release of the movie. Some say rights to the movie became clouded since it was supposedly produced with public funds. All we know is that distribution stopped before reaching the USA, and our efforts to restart that have met nothing but silence. The problem is that English language version was produced for Great Britain and conforms to the PAL European DVD format which will not play in American DVDs, only some of our PCs. As it turns out, Korea subscribes to the NTSC DVD format, which is the same as that used in the USA, and they were on the list of countries receiving distribution rights before the movie managers went silent about continuing into the USA. 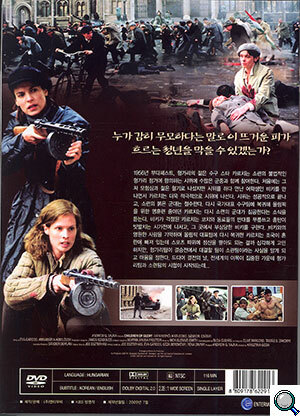 The Korean version has Korean language writing on the DVD jacket, but the movie dialog is in Hungarian and the English subtitles on their DVD are authentic and professionally done. By simply switching the subtitles from Korean to English, you can enjoy this breathtaking movie in your American DVD player. These are not pirated copies or illegal. These were produced legally in Korea and sold in the USA. If at any point in the future the owners to the rights of the Children of Glory movie begin distribution in the USA, you will see only their DVDs on this website, or a link to them. Our mission is simple. We want every Hungarian in the USA to see this magnificent epic of that moment in history when our little nation changed the world. Copyright © 2011 Bizware Online Applications, Inc. All rights reserved.